In a nondescript industrial park in Merrimack, New Hampshire, Jason Walker is putting the final touches on what he believes will become the iPod of working robots. Walker, 47, is co-founder of Waypoint Robotics, and the former lead quality and testing manager for the Roomba vacuuming robot. Waypoint, a tech startup about a year old, is housed in one cavernous room with high ceilings and a barebones office upfront filled with large, flat-screen monitors. “We don’t splurge on anything except screens and chairs,” Walker says in the easy drawl of his native Kansas. Although he makes no claims to being another Steve Jobs, Walker does fervently believe that he and his small team are going to revolutionize robots in the same way Jobs revolutionized MP3 players. “You had to be a computer science person to figure out how to make them work,” Walker said. Apple, he says, did everything right. How does that apply to robots? How do you make robots easy? Walker and his team demonstrate, first boxing up the Waypoints Vector, their first and only robot at this point, in a wooden Quick-Crate, which goes together with metal clamps that snap in place and are easily removed with a provided tool. Step 1: Make it easy to uncrate the 100-pound Vector. The robot, measuring about three feet long and two feet wide, is an aluminum platform mounted on four, independently powered Mecanum wheels that allow it to manuever as if it were skating on ice. The Vector can go forwards and backwards and sideways and any direction in between. It can carry up to 300 pounds. The distinctive Mecanum wheels were invented by a Swedish company in 1972 and are used by the U.S. Navy to transport bombs and other items within the tight confines of a battleship. The wheels are comprised of a series of rollers positioned at a 45 degree angle. When forces – vectors – are applied to the wheels in various combinations, they can move in any direction. That manueverability is important to the Waypoint Vector for a couple of reasons. It allows the robot to navigate its way through a warehouse with ease, sidling up to loading docks and drop-off points. It also allows the Vector to “dock” with Waypoint’s Enzone wireless charging station, where it fully recharges in a couple of hours without plugging anything in. Walker says there are several key benefits to the Enzone. Wireless charging means there are no mechanical contacts to wear out or get dirty. “The idea there is if the robot is parked at a machine or loading dock, waiting to get a package put on its back, you can put an Enzone in that place and get it charged while it’s waiting,” Walker said. Popping off the clamps to uncrate the Vector, Walker uses one side of the Quick-Crate to build a ramp to drive the robot onto the floor of the shop, steering with the supplied joy stick. Next, he places a notebook computer on the Vector’s platform and begins driving it around the perimeter of the shop, skirting tables, chairs and shelves and stopping occasionally to mark a waypoint for an imaginary loading dock or drop-off point. Everything Walker is doing is being prompted by software created by Nick Varas, one of three members of his tight-knit team. Walker will only hire what he calls “full-stack” robotic engineers. Once Walker has mapped the room by driving the Vector around it, he brings the robot back to retrieve the notebook computer. The Vector “sees” using laser-based Lidar sensors front and back, which Walker describes as a plane spreading out 10 yards on each side of the robot. Whatever that plane intersects, the robot can see, but there are blind spots, both above and below the plane. “That’s where you run into trouble where the robot thinks it can go through someplace where somebody left something hanging over, or parked a cart,” Walker said. Full three-dimensional perception is an option for robots like the Vector, but it is prohibitively expensive, Walker said. As it is, the Vector costs $40,000. The software prompts Walker to create boundaries on his map, using his finger on the touch screen. “I’m going to draw a circle around that table because it’s hard to see,” Walker said. After blocking off a few other areas of his map, Walker is ready to proceed to navigation. “Every step it tells you what you need to do next,” Walker says. A button, “Set a goal,” comes up on the screen of the computer. On its way to its goal, the Vector navigates around people standing in its way, an important feature for its intended use in warehouses. Mertinooke uses a different analogy than Apple to describe what Waypoint is doing for robots. The inspiration, he says, is Picasso. The idea, says Mertinooke, is to distill robots to the essence of what they need to be. Walker sold 13 Vectors in his company’s first year, but some of them have gone to very important customers — tier one automotive suppliers. 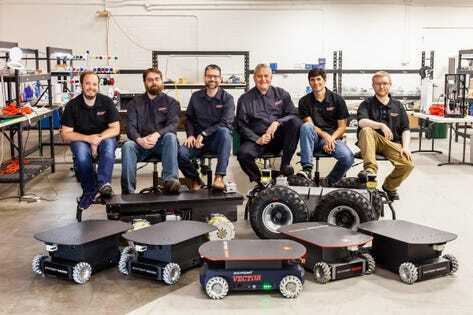 With his team closing in on perfecting all the elements that will make the Vector the iPod of robots, Walker is confident that Waypoint Robotics will grow exponentially. Automation is a “must” for American manufacturers, he says, in spite of the fact that he estimates only 10 percent of the companies that could automate, have automated.